The crocuses are gone, the hyacinths are almost done blooming, a lot of daffodils are done blooming (especially the early kind) and finally the regular tulips are in bloom. Last week was nice and warm enough to turn the green fields into color. And this week will be the same weather wise. You still need a bike or a car to drive around the fields. There are some fields visible from the windmill platform. If you want to see some more fields just rent a bike outside and drive one of the routes provided. 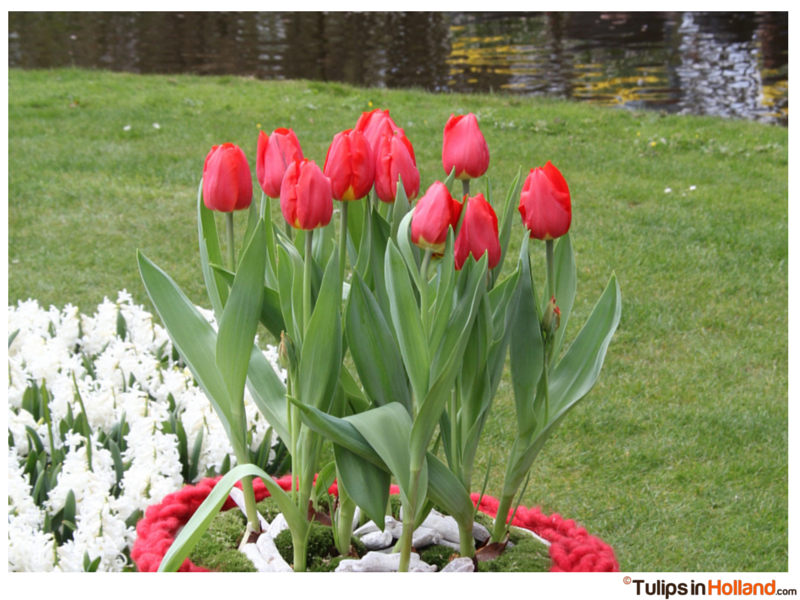 And for photos of the flower fields and my visits to Keukenhof please visit our photo album. As mentioned before Keukenhof looks gorgeous! Inside the crocus are almost gone, the the daffodils are in bloom, the hyacinths are blooming and de regular tulips are blooming too. Every day I see new colors appearing around the Keukenhof. The famous blue river of muscari is almost in blue color. When you are visiting this week make sure you visit. Last weekend the daffodil show was started with more than 100 different daffodils. I never knew there were that many! Even selected a couple of my favorites for my spring garden next year. And the orchids exhibition draws a lot of attention. I can walk hours around the garden seeing something new every time. The weather forecast is lovely until this Friday. At this point rain is expected over the weekend (the flower parade!) and for next week. The daffodils and the hyacinths are slowly going to stop blooming and the tulips are blooming for this week and probably also for the week after. For people traveling in May. 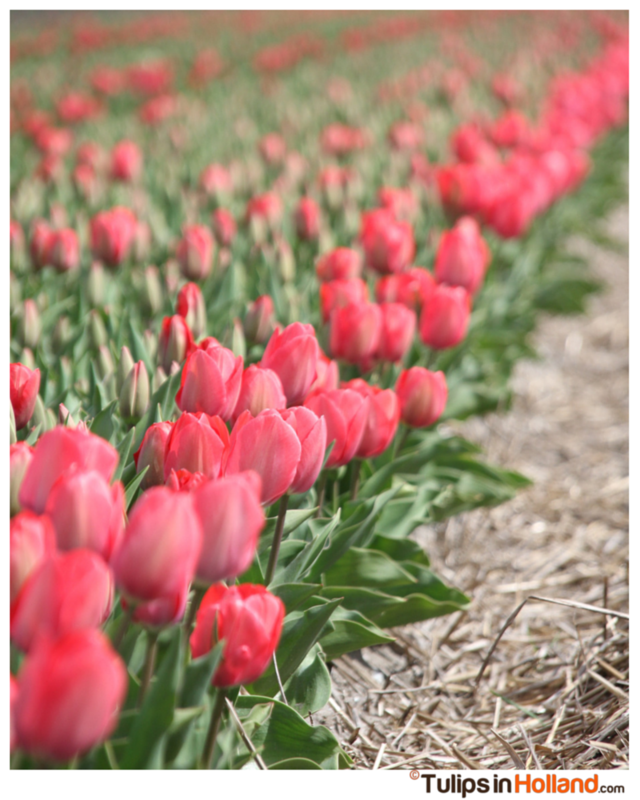 Make sure you visit as early as possible if you want to see the tulips in the fields. I expect the fields being headed around the first week of May. They won’t be headed all at the same time but the fields are turning into green very quick. See a short video about heading the tulips here. On the left you see the new Nijntje or Miffy tulip. Just got her name last Sunday. For updates of previous seasons, have a look at our website. Thank you to all who shared, liked and commented in the last week. Much appreciated! I love to share all the tulip information with you.Wishing you a wonderful week and for every one traveling this week have a wonderful holiday in the Netherlands. 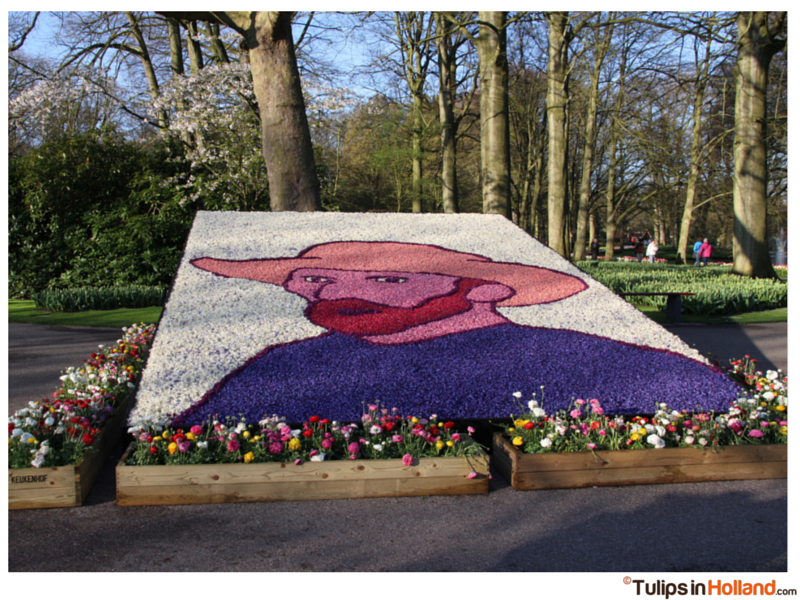 I’ll be visiting Keukenhof on 5th of May 2015. Is it still a worth of visit? Will there still be tulips and all the beautiful color to look? Thank you for the update Asad. Hope you have had a lovely time at Keukenhof! What do you think would be better for a visit to Keukenhof; this Friday or the following Friday? I’m concerned that if I leave it until next week the weather is going to be awful and the flowers won’t look as impressive. Hi Andrew, I know that the Keukenhof and the fields look wonderful now. You can wait till next week but the time and weather can indeed influence the blooming. 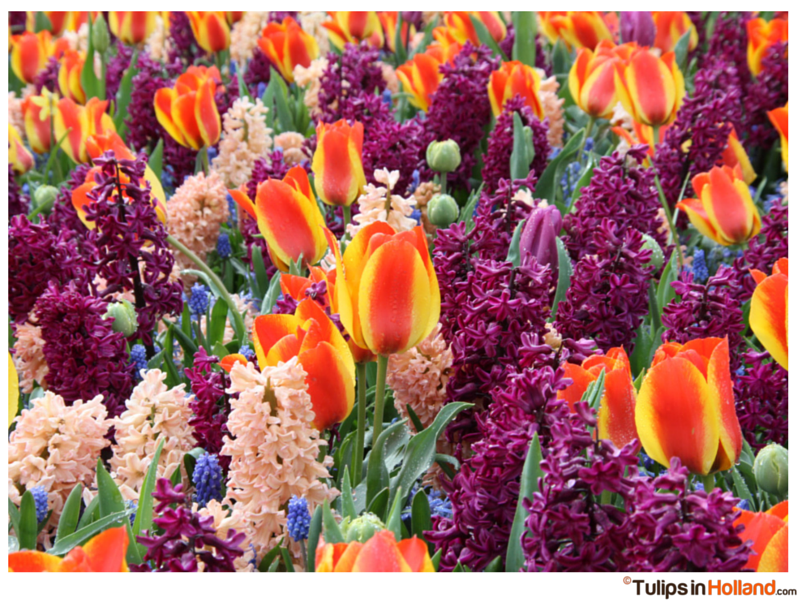 I’ll be visiting Keukenhof at the 5th of May 2015. Where there’ll be tulips inside the garden and the flower field? I’m visiting Amsterdam next week (1st May)and putting up at Zandvoort.Want to cover tulip fields on bike and probably gardens separately next day.Is it worth spending one full day for fields, if they are headed by then? Hi Dave, the fields will be ok by mid next week. The Keukenhof will look wonderful too. Hi everyone, we were at Keukenhof yesterday and the garden was amazing. Most of the flowers (almost all of them) were in bloom in the gardens. It would be great time for flower lovers in the keukenhof. But i would like to point out one thing that the boat ride in the keukenhof was not at all worth (atleast if you don’t have plenty of time) as most of the fields were empty where the boat ride will take place. Though there were few fields in that area, many of them were already budded off. 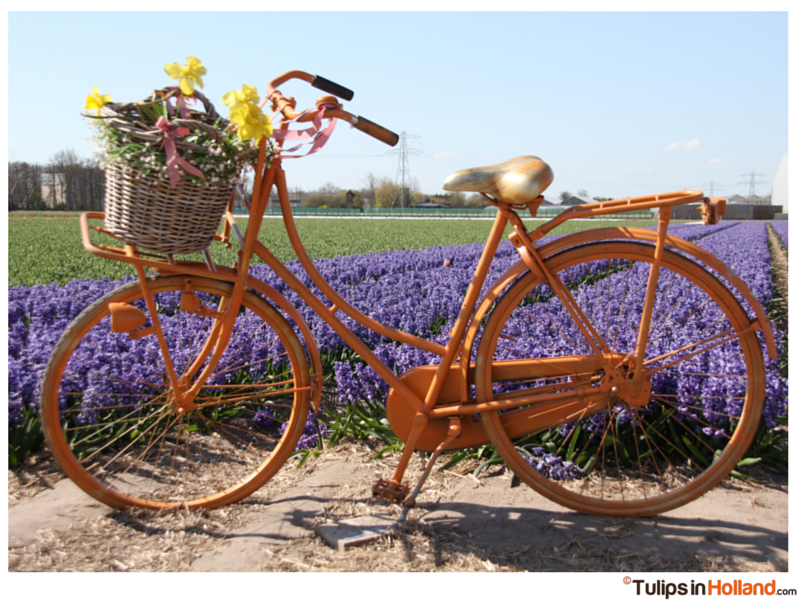 Instead, you can try cycling around the fields which are in bloom and they are easily reachable from keukenhof. And one more important thing for those people who are expecting to enter into the fields have some picture as shown in the google images and movies (as i expected), VISITORS ARE NOT ALLOWED INTO THE TULIP FIELDS and at most of the fields you will see private area sign boards. Finally, many thanks to tulipsinholland.com your tips,information blogs and weekly updates helped me a lot to plan our trip. Thank you very much and keep going. All the best and have a nice trip. We are travelling from Bruges to our hotel near keukenhof on 5th May by CAR. Can you please let us know if there is any tulip route from The Hague to Keukenhof instead of taking the usual motorway. I am sure they may be headed by then but just wanted to try my luck. Hi Ram, Just take the A44 to sassenheim and take the N208 from sassenheim to Lisse. If there are any fields you will see them along the N208 between Sassenheim and Lisse. Thanks for the info. I have been looking at various websites about visiting keukenhif and your blog undoubtedly stands on the top list. Hi Ram! Thank you so much for your very kind words 🙂 Have a wonderful Sunday! 1. If we were able to get bikes, how far are the fields we could see, and how can we know how to find them? 2. I know the big flower parade is tomorrow! Do you think that will make it difficult to rent and or ride the bikes? Thank you so much for your help and your beautiful blog!!!! Hi Pamela, please be early if you want to rent a bike. You will get a map while renting a bike and have a look at the map in this update (towards the end). I drove around yesterday and saw some beautiful fields along the N433 between Sassenheim and Noordwijkerhout. Especially around the Loosterweg crossing. But you will find beautiful fields along the way. Wishing you a wonderful day! Thanks so much!! You too!! Hi Karen, You are mixing two things. The parade was held last Saturday. We still have tulips in the field. But the tulips in the fields are headed just after peak blooming to strengthen the bulbs before they are taken out of the ground this summer so they can be exported around the world this summer/autumn. The heading of the tulips will start just after peak blooming and that depends on the weather and the decision of the farmers. If you are visiting Keukenhof first have a look at the platform of the Windmill to see if you can still see some fields in bloom. If you don’t see one than it is not advisable to rent a bike to bike around the fields. Have a wonderful time! Hi Dave, This Wednesday you will be fine for visiting the tulips. Have a wonderful time! I plan to go tomorrow the 28th April. Is the peak bloom over. R the fields still with tulips? Hi Rohita, tomorrow will be fine for Keukenhof and the fields. Planning to visit this Saturday, 2nd May. Are the tulips still going to be there or headed? many thanks. Keukenhof will look wonderful and there is a chance that some tulip fields will be headed. Hi Nienke, we will be at the Keukenhof park on May 8th, will there be many flowers in bloom there then? I’ll be in Amsterdam on thursday 30. I’d like to visit Keukenhof and the fields nearby. Is it better to see the fields before (30 april) not to find all the flowers headed, and then Keukenhof (1 may)? How long it takes to take a ride nearby the fields by car? How does it work car parking at Keukenhof? Do I risk not to find a place if I don’t buy the parking place in advance? Normally people visit just one day to see the fields and Keukenhof together. A bike ride is more advisable than a car ride. The roads are narrow and it is easier to park your bike than a car. A couple of hours will be enough. There is a huge parking space at Keukenhof and you pay 6 euro for parking. Just follow the signs in Lisse. Hi, we are planning to visit Keufenhof on 2nd or 3 rd May, probably 2nd if our flights land on time. Just read quite a few comments speaking about heading of tulips. Are we too late? The tulips at Keukenhof won’t be headed. It is the tulips in the fields that are going to be headed just after peak blooming. 🙂 So you are not to late for a visit to Keukenhof. In fact it looks wonderful now! Thank you for the prompt reply. I really appreciate your blog! Do you know if we can walk through any fields around? Thanks! Hi, it is not allowed to walk into flower fields. The bulbs are grown for the export and walking into a field can damage these bulbs. You can see them very easily from the side and roads. We will be at Keukenhof on 4th may 2015. The view on the flower fields from the windmill at Keukenhof, as posted by visitors so far, is not that interesting. Are there any flower fields at walking distance (1-2Km) from Keukenhof that would make my day? I shall be travelling with an infant, so renting a bike is not an option. Hi Ram, This year the flower fields are located a bit further away from Keukenhof. (You can’t grow bulbs twice in a row at the same spot) But there is a red field across the main entrance of Keukenhof. When you arrive by bus you turn right when entering the Keukenhof grounds. On the left side you can spot a small tulip field. Thanks again for the prompt reply! I follow your blog totally! Do you think the tulips will still be in bloom by the 15th of May? If not, will there be other flowers in bloom to make a visit to Keukenhof worthwhile? Hi Jo, the 15th of may is the very end of springtime in the Netherlands. The Keukenhof garden generally looks lovely till the end of season however compared to peak blooming now there will be less tulips visible. I expect the tulips in the fields to be headed by than.